Distal clavicle osteolysis is a condition that affects mainly weightlifters, but it can affect athletes in sports that use the upper extremities. It is a painful condition that develops over time rather than with one specific injury. It occurs at the end of the clavicle (collarbone), as it joins with the tip of the shoulder blade at the acromioclavicular joint (the joint involved in shoulder separations). The bone at the end of the clavicle becomes less dense, and the AC joint becomes more painful. Typically the weightlifter will complain of pain on the front of the shoulder. Often he will complain of pain with weightlifting activities that compress the joint, such as bench press and military press. 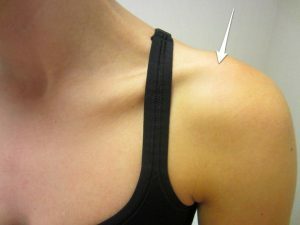 A sports medicine physician can often localize the pain by pressing the end of the clavicle at the AC joint. Having the athlete raise his arm across his body, such as touching the opposite shoulder, can increase the pain. X-rays will often show that the clavicle is less dense at its tip where it joins the AC joint. An MRI can be helpful in cases where x-rays are not definitive. Typically initial treatment is nonoperative. Short-term rest from weightlifting, anti-inflammatory medications, and ice can be helpful. If symptoms return, or the athlete has difficulty stopping the offending activities, an injection of cortisone into the AC joint can be attempted. If symptoms persist despite these attempts at nonoperative treatment, surgery to cut off the end of the clavicle usually resolves the symptoms. Return to weightlifting and other activities is variable, but after surgery the athlete can usually return in a few months with no long-term disability.